With the reputation of the United States at stake, President Bush readies himself to pick a successor to Paul Wolfowitz. Traditionally, the US has chosen the President of the World Bank while Europeans have chosen the head of the International Monetary Fund. Now, given the scandal at the World Bank, Europeans are suggesting that this practice cease and that Wolfowitz’ successor be chosen on merit and not nationality (a code for crony of Mr. Bush).Given the falling reputation of the United States across Europe due in part to the mishandled war in Iraq and the bungling choices made at the World Bank, perhaps the White House should listen for a change. Consultation is not, however, the strong suit of the Bush White House as an administration that has grown used to having its own way on just about everything until recently. U.S. Treasury Secretary Henry Paulson has said he would help Bush identify a nominee after consulting with other countries. But he made clear it would be an American. “I see no reason why this should change and I see every reason why it’s important that the World Bank should continue to be run by an American,” Paulson said. Dutch Development Minister Bert Koenders said the stature of the candidate was more important than nationality. “The quality of a new candidate is the most important thing. Whatever nationality, American or from another continent, the bank needs a president of the highest quality,” he said. Henry Paulson makes it absolutely clear that the Bush Administration is not listening to the rest of the world. The fact that he sees no reason to change past policy is an arrogant response in the light of the need for the last Bush choice to resign in disgrace. I wish I had confidence that Bush will do the right thing in this matter. The fact is that I do not. WASHINGTON (Reuters) – A day after Paul Wolfowitz resigned as World Bank president under an ethics cloud, the United States faced the tough task of healing rifts with Europeans and satisfying calls that his successor be picked on merit, not just nationality. 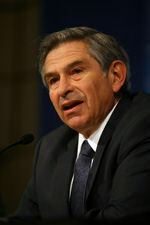 Wolfowitz’s resignation on Thursday followed pressure by European opponents who said his handling of a high-paying promotion for his companion damaged the institution’s credibility. Bank staff complained the crisis had undermined their mission of fighting poverty in developing countries. The United States, the bank’s largest shareholder, has named the World Bank chief since the bank’s inception more than 60 years ago. It is also clear from the comments of Tony Fratto and Henry Paulson that the Bush White House continues to exist in a state of denial. While it has been the traditional role of the President of the United States to appoint the President of the World Bank, there is a strong movement to reexamine that practice or, at the very least, curtail the cronyism practiced by this White House. Perhaps the time has come for a fair and transparent process for the selection of the next president of the World Bank. Perhaps the rest of the world will not be governed by the hubris of the Bush White House. We in the United States must only suffer 613 more days of this administration. Good Riddance. Now Bush only has to deal with the scandals at Justice and the Department of Education, and, oh yes, the potential indictment of his closest adviser, Karl Rove. WASHINGTON (Reuters) – World Bank President Paul Wolfowitz, under fire for arranging a pay and promotion agreement for his companion, who was employed by the bank, announced on Thursday he will resign effective June 30. I intend to move quickly to help the President identify a nominee to lead the World Bank going forward. More trouble for the Bush White House it seems. Apparently there is no absence of arrogance at the White House, lessons learned from the Nixon White House no doubt. As the scandals grow around this administration, Bush grows more determined to wallow in the disaster of Iraq, support his buddies Gonzales and Wolfowitz as they fall down the slippery slope, and even threatens to veto the hate crime bill that will soon come his way. How ironic. Bush’s actions are the actions of a president in deep trouble willing to risk the welfare of the nation to shore up his position. I just returned from a brief visit to Canada. Just reading the newspapers in Montreal was enlightening. There is no pro-American, patriotic spin placed on the news outside the United States. Because of my distinct middlewestern accent I was easily recognized as being from the States. There was no holding back. I was expected to defend Bush–something I would not do. My refusal brought sighs of relief–not all Americans are that bad after all was the message sent and received. I had the same sense in Italy a year and a half ago and in Australia nearly three years ago. It is difficult to travel the world when the world thinks so little of you. I am hopeful, however, that this will change after the next election. The Bush administration has withheld a series of e-mails from Congress showing that senior White House and Justice Department officials worked together to conceal the role of Karl Rove in installing Timothy Griffin, a prot�g� of Rove’s, as U.S. attorney for the Eastern District of Arkansas. The withheld records show that D. Kyle Sampson, who was then-chief of staff to Attorney General Alberto Gonzales, consulted with White House officials in drafting two letters to Congress that appear to have misrepresented the circumstances of Griffin’s appointment as U.S. attorney and of Rove’s role in supporting Griffin. In one of the letters that Sampson drafted, dated February 23, 2007, the Justice Department told four Senate Democrats it was not aware of any role played by senior White House adviser Rove in attempting to name Griffin to the U.S. attorney post.